Work has finally begun on clearing out the ramblas and barrancos on the Costa Tropical, starting with Almuñécar. It’s not only the coast of Granada but also the Alpujarra that will be included within the 1.2m budget from the Junta’s coffers for this task. The Territorial Delegate for the Juna, Inmaculada Oria, said that the majority of the work will be carried out on the coast, however. The budget includes 462,838 for Salobreña, 409,224 for Motril, 127,924 for Lújar, 65,791 for Albuñol and 32,737 for Almuñécar, amongst other municipalities. In La Herradura the Río Jate will be cleared (from the N-340 to the beach) and Rambla de Las Tejas as well. In Almuñécar the last 800 metres of Río Seco, and the Rambla de Cotobro. 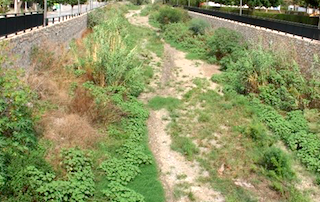 The Junta is also planning on clearing another 500 metres if Río Seco the Rambla de Cabría from the N-340, as well as work on Río Verde and ramblas with Jete. As work progresses other municipalities will be included: Motril, Albuñol, Cádiar, Ízbor, Gualchos-Castell de Ferro, Ítrabo, Jete, Lújar, Molvízar, Rubite, Salobreña, Sorvilán, Ugíjar and Vélez de Benaudalla. Lastly, the Junta Delegate pointed out that the town halls are responsible for water courses where they pass through urban areas; not the Junta. This entry was posted on Monday, October 1st, 2018 at 1:20 am	and is filed under Alpujarra, Granada Costa. You can follow any responses to this entry through the RSS 2.0 feed.